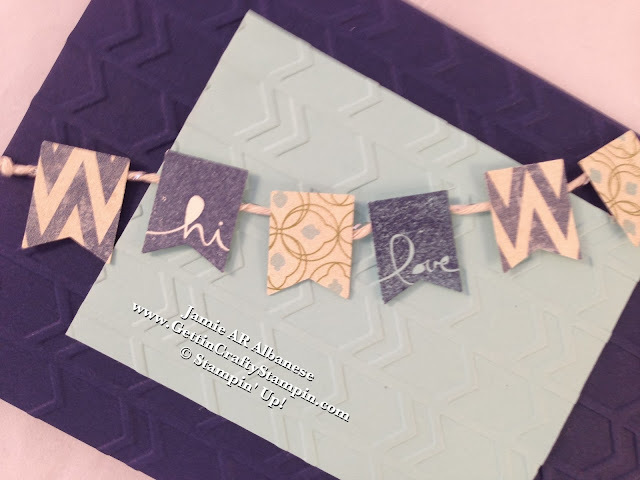 Hanging banners, chevrons, dashes of metallic accents... this card has all these uber trendy accents in one card! 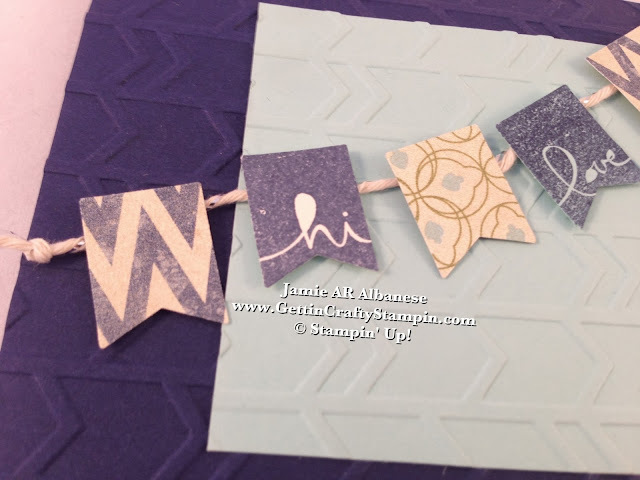 Using the FREE Sale~A~Bration Banner Blast stamp set and FREE Sale~A~Bration Banner coordinating punch, you, too, can create cute hanging banners on your hand-stamped and embossed cards! 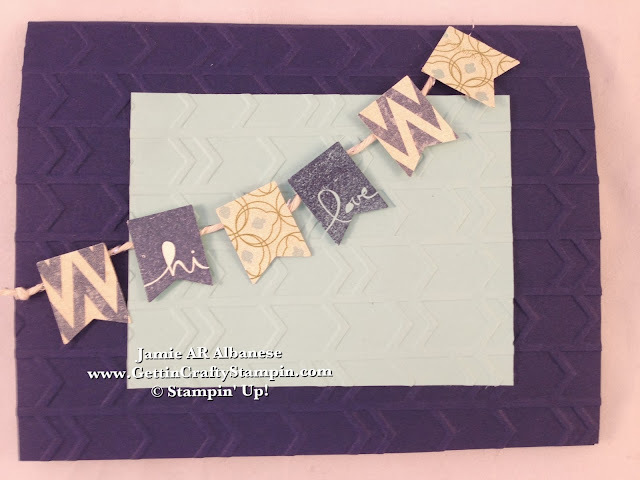 Say Hi and send some Love with this cute card using the FREE Sale~A~Bration Banner Blast stamp set and Banner coordinating Free Punch! Stamping these cute flags on Very Vanilla card stock. Using the coordinating and FREE Sale~A~Bration Banner Punch to pop them out is easy and uber cute! Punching the Etcetera Designer Series Paper gives me some fun and vintage flags to add to this hanging banner! Banners are all the rage! 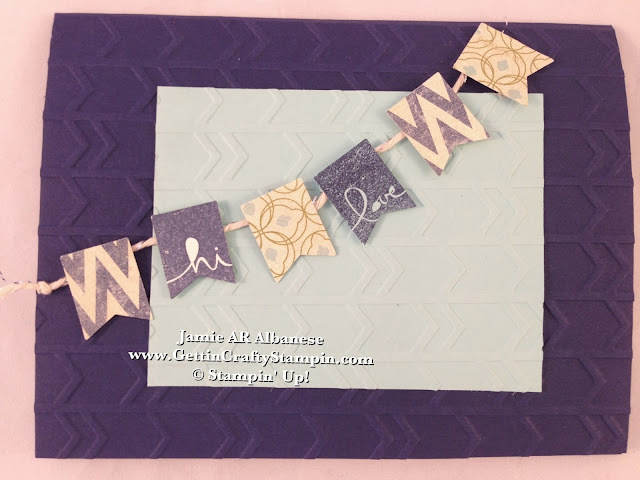 Sending this cute mini banner on this embossed and hand-stamped card is a great way to send some love! 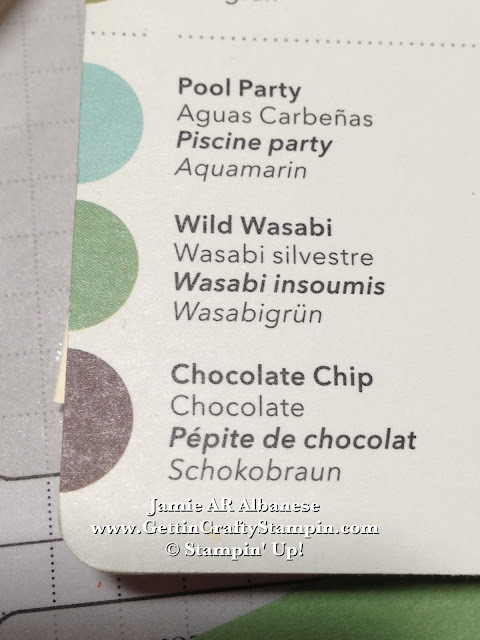 Create the background when you adhere the Pool Party card stock to the Night of Navy card stock. Run them, adhered together, through the Arrows Embossing Folder (Occasions Let's Celebrate mini catalog) and Big Shot. Two card stocks at a time can make for a tougher turn but the Big Shot is super strong and does a great job! Chevrons and Arrows are super trendy! 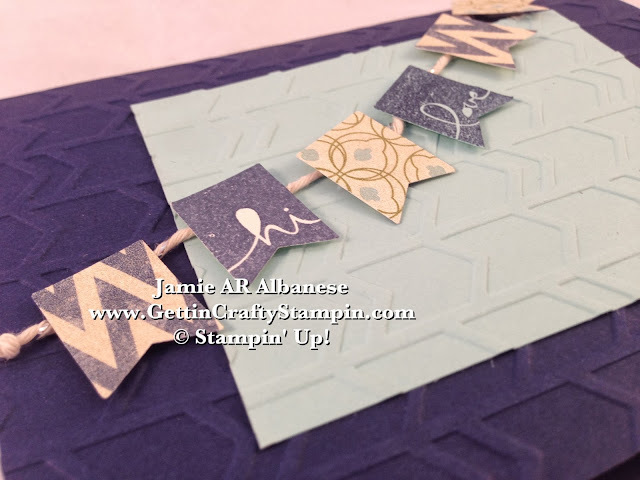 Show your style and embrace the fun of it with this cool card base! Lay out the Silver Bakers Twine (Occasions Let's Celebrate mini catalog) on the card stock. I knotted each end for a cute accent. The subtle dash of silver pops on this cool blue on blue card. Layer the flags over the knotted Silver Baker's Twine and using the Stampin' Dimensional adhesive to hold the hanging banners and the Baker's Twine down at the same time! This puffy adhesive will create depth while wrapping around the Baker's Twine to hold it in place, too! See this Baker's Twine Tutorial for using the new Gold and Silver Baker's Twine so you don't unravel! This blue on blue, hand-stamped and embossed card is a great way to show that you are on the cutting edge in style! With hanging banners, dashes of silver, embossed chevron arrows and a vintage vibe?? You have hit some of styles trendiest accents!! (It's fun to be with a company that translates the cutting edge style and trends into my paper-crafting needs!) This card is a great way to show you care and the FREE Stamps and coordinating Punches are a great way to have fun while saving some green!